Non-grounding 4-wire, 20 amp, 120/208 volt. Electro-Rail® Nylon plugs and connector bodies are fully compatible with Hubbell®, Inslgrip®, Twistlock® and other twist & lock 4-wire devices. These heavy-duty devices are nearly indestructable. 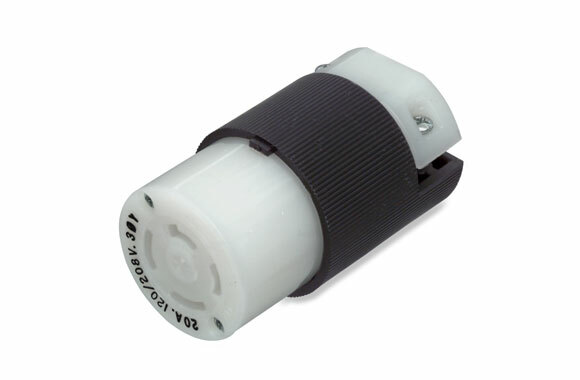 Components are made of black and white nylon with a power cord grip range of .385" to .780". Both plugs and connectors are 4-wire locking. 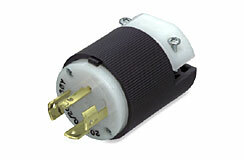 Rated at 20 amps, 120/208 volts, 3 phase "Y" AC. Item: 4-Wire connector (male). Note: Underwriters Laboratories Inc.® Listed. Item: 4-Wire connector (female). Note: Underwriters Laboratories Inc.® Listed.